While many people are preparing to go to the beach for a spring vacation, there are so many other places in the world to visit. 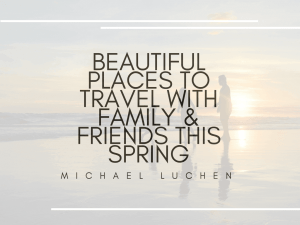 Below, you will find just three of the many beautiful places you can travel to with your friends and family this spring. With the coming of spring, you’ll find the sidewalks in Vancouver lined with freshly fallen cherry blossom petals since the entire city and outlying suburbs are rich with cherry blossom trees. Take the futuristic sky train system from city to city as you browse through bookshops, sprawling markets, and restaurants that serve food from every continent. Don’t forget to stop in Richmond to bask in the food and foreign product palace that is the Richmond Night Market. Whistler Blackcomb Ski Resort is still open during the spring and taking skiers and snowboarders alike. Victoria on Vancouver Island is an essential place to visit. It can only be reached after a nearly three-hour-long ferry trip across beautiful waters and small islands. Regardless of the sights and adventures that you and your family want to enjoy, you can find it all in Vancouver as well as that famous Canadian hospitality and maple syrup, eh. Not to be outdone by Vancouver, the heart of our nation’s capital also boasts it’s own season of cherry blossom trees in a Cherry Blossom Festival held every year. These trees line the Tidal Basin and blossom into full, vivid colors for only a few days, so it’s vital that you check in with the Cherry Blossom Watch website to learn updates and time frames to view the cherry blossom trees in their full splendor. In addition to festivals, D.C. is rich with museums, tours of the capitol buildings, and a deliciously diverse food culture. Renew your passport and go on a European vacation in Sevilla, Spain. Spring is the best time to visit this rich and beautiful country since the orange blossoms will be in bloom, spreading their sweet scent across the city. Being such an ancient city, Sevilla possesses an impressive cathedral and the La Giralda tower that looms over everyone below. You can even visit a real Moorish royal palace that is now considered a World Heritage Site. All-American vacations are like no other vacations. There’s nothing quite like gathering up the kids, putting them in the car, and taking them on the road. The best family vacations are the one that reminds you of your own experiences with family. Whether you and the entire family decide to turn your wheel west and head toward Boston, or South and head toward Disney World, there are some options for a family vacation this upcoming Spring or Summer that’s as fun as it is educational. Boston: Boston is incredible because it has incredible parks, culture, and amazing sports. The attractions, such as the New England Aquarium, is lovely, and the city has an astonishing sporting history that indeed extends to baseball. Washington, DC: The nation’s capital is a vibrant city that loaded with remarkable government buildings, landmarks, and monuments. The Capitol, the Lincoln and Jefferson Memorials, and the White House demonstrate the glory of this great nation. Visits to the city also mean access to the original “Star-Spangled Banner” and the Air and Space Museum. This, of course, is just the tip of the iceberg. Gettysburg: Gettysburg is a city that’s marked by its rich history. The town is educational and beautiful, so guided bus tours of the town and historical re-enactments are frequently in demand. It’s enjoyable for the entire family. Huntsville: Huntsville, Alabama is a stunning place to visit because of its wealth of NASA memorabilia. Also, there’s the Purdy Butterfly House and Huntsville Botanical Garden. Williamsburg: Williamsburg, Virginia is an exceptional place to visit, as it houses the country’s largest interactive museum. The colonial history of the area is alive and well and educates visitors through evocative exhibits and a trip down memory lane. Perks of visiting Williamsburg also includes Busch Gardens amusement park, family-style dining, and beautiful scenery. Some other places you may want to visit in Bloomington, Minnesota; Charlotte, North Carolina, or Williams, Arizona. What other great American cities are you looking forward to traveling to with your family? There’s New York, and then there’s everywhere else. Anyone who’s been to New York, including celebrities, will tell you just that. New York City is an incredible show stopper kind of town. No, it has the studios of Hollywood or the clean streets of Chicago, but it has so much more.. Find the rest of the blog post by visiting MichaelLuchen.org. New York is filled with incredible places to enjoy your staycation with the kids. You can enjoy your holiday in the parks, at the movies with a glass of wine, or by being a tourist. Bronx Zoo Have an all-day affair at the Bronx Zoo. No need to travel to Asia to see the Himalayan …read the rest of the blog post by visiting MichaelLuchen.co. Experienced users like the fact that they can track spending, transfer funds, and its wealth management functions with Alipay. Tencent went further by building platforms for businesses, where their customers can be alerted to discounts and promotions… find the rest of the blog post by visit MichaelLuchen.net! China Has Gone Cashless, Is The U.S. Next? The brave new world is a cashless one. According to the Wall Street Journal, mobile payments have swelled to an astounding $9 trillion a year in China, publicizing the purchasing and borrowing behaviors of EACH Chinese residents, including the panhandlers. Among the…find the rest of blog post by visiting MichaelLuchen.net. Enterprises and corporations now have access to a bevy of processing solutions and payment options, thanks to a host of industry-leading payment processors able to serve a changing marketplace, including OkMerchant. Domestic and international markets have identified… find the rest of the article by visiting MichaelLuchen.net.